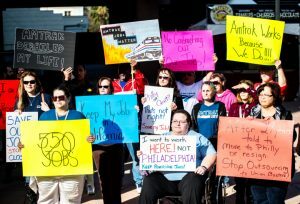 Yesterday, TCU/IAM members from Amtrak’s Riverside call center rallied to save their jobs. 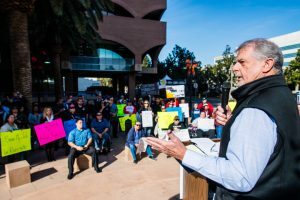 Well over 100 people turned out to the Wednesday morning protest to show their outrage with Amtrak’s management and their short-sighted decision to eliminate 500+ jobs in Riverside, and send their work to a non-union, low-wage outsourcer in Florida. 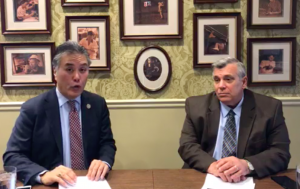 Rep. Mark Takano (D, CA-42) and TCU NVP Ron Kloos hosted a Facebook live conversation about the Riverside call center closure. Congressman Takano is currently getting final signatures on a bipartisan letter that includes 38 of his colleagues from California’s congressional delegation, demanding that Amtrak immediately reverse their decision and keep the call center open. The Members of Congress cite California’s robust financial support for Amtrak, both through their state-supported services as well as long-distance routes. Congressman Calvert went further in demanding that Amtrak keep the facility open until at least July, 2019, to at least allow Congress time to assess the issue and give employees adequate time to make life-changing decisions. The post TCU rallies in Riverside to save jobs, stop outsourcing appeared first on IAMAW .